Add all of the Poppy Seed Dressing Ingredients to a medium bowl or measuring cup and whisk together with a fork. Chill at least 30 minutes up to 24 hours. Cook pasta according to package directions until al dente – don’t overcook! Rinse and drain pasta in cool water. Add pasta to a large serving bowl and toss with a little of the dressing to keep it from sticking together. Add all of the salad ingredients to the pasta. Add desired amount of chilled dressing and gently toss to combine. Serve immediately or chill one hour. 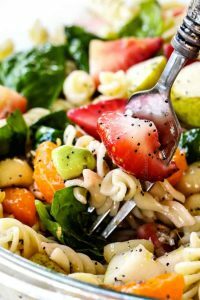 Add strawberries and Mandarin oranges to pasta and toss with half of the dressing, cover and refrigerate. 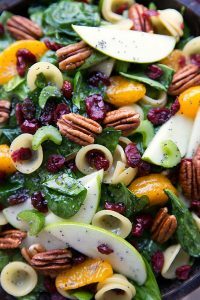 When ready to serve, add pears, avocados, spinach, macadamia nuts, and remaining dressing. Toss to combine. Serve immediately. While the pasta is cooking, prepare the dressing. In a food processor or blender (I used my small Twister jar on the Blendtec) combine the apple cider vinegar, white wine vinegar, sugar, (adjust — more or less to personal preference, we like a less sweet dressing and use about 2 tablespoons) paprika, and onion powder. Pulse or blend for about 10 seconds. Slowly add in the oil and pulse until just combined. Stir in the poppyseeds. IF you don’t have a blender or food processor you can combine the ingredients in a bowl or mason jar and whisk (or shake jar) vigorously. Drain the pasta once it’s cooked through and immediately toss a few tablespoons of the dressing with the pasta. This helps the pasta soak in the dressing and the flavor. Chill the dressed pasta in the fridge. Meanwhile, combine the (washed and de-stemmed) spinach with the chopped celery in a large bowl. Add in the cranberries and a can of drained mandarine oranges. If desired peel the apple (We like to leave on the peel!) and then slice into thin slices. Toss with lemon juice and then add to the salad. Pour dressing over the salad and toss. Add in the completely cooled pasta and toss with the rest of the salad. If you want to toast the pecans, place them in a single layer in a dry saucepan (don’t add anything) over medium heat. Stir constantly until the nuts are barely fragrant — just a couple of minutes. Watch carefully as the nuts are VERY easily scorched/burned. Top the salad with the pecans and (if desired) feta cheese. Cook pasta according to package instructions, drain and rinse with cold water. Set aside. While pasta is boiling, prepare the dressing. In a jar combine all dressing ingredients. Cover and shake to combine. Chill until ready to use. 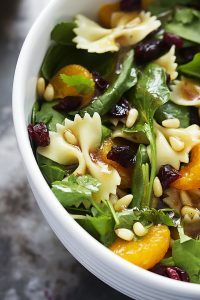 In a large bowl toss together pasta, spinach, raisins, nuts, mandarin oranges, and cilantro. Just before serving pour dressing over salad, toss, and serve. While the pasta is cooking, prepare the dressing. In a food processor or blender (I used my small Twister jar on the Blendtec) combine the oil (the vegetable oil yields a richer and in my opinion better taste, but the olive oil is healthier and still tastes great), apple cider vinegar, white wine vinegar, sugar, (adjust — more or less to personal preference, we like a less sweet dressing and use about 2 tablespoons) paprika, and onion powder. Pulse or blend for about 10 seconds. Stir in the poppyseeds. Alternatively, you can candy the pecans if desired. Check the link in the last paragraph of the blog text for how to candy pecans. Top the salad with the pecans and feta cheese. This salad (like most) aren’t very great leftover. If you aren’t eating this immediately, keep the ingredients separate from the dressing and only toss with the dressing right before eating. 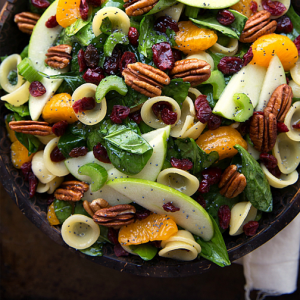 Top with pecans and feta after dressing the salad.